The resources available on the Earth and the energy from the Sun are necessary to meet the basic requirements of all life-forms on the Earth. The outer crust of the Earth is called the lithosphere. Water covers 75% of the Earth’s surface. It is also found underground. These comprise the hydrosphere. The air that covers the whole of the Earth like a blanket, is called the atmosphere. Living things are found where lithosphere, hydroshpere and atmosphere these three exist. It is a mixture of many gases like nitrogen, oxygen, carbon dioxide and water vapor. It is interesting to note that even the composition of air is the result of life on Earth. (i) Green plants convert carbon dioxide into glucose in the presence of Sunlight and (ii) many marine animals use carbonates dissolved in sea-water to make their shells. The movement of air from one region to the other creates winds. When water bodies are heated during the day, a large amount of water evaporates and goes into the air. Some amount of water vapor also gets into the atmosphere because of various biological activities. This air also gets heated. The hot air rises up carrying the water vapor with it. As the air rises, it expands and cools. This cooling causes the water vapor in the air to condense in the form of tiny droplets. Once the water droplets are formed, they grow bigger by the ‘condensation’ of these water droplets. When the drops have grown big and heavy, they fall down in the form of rain. When fossil fuels are burnt, nitrogen and sulphur too are burnt and this produces different oxides of nitrogen and sulphur. Not only is the inhalation of these gases dangerous, they also dissolve in rain to give rise to acid rain. Presence of high levels of all these pollutants causes visibility to be lowered, especially in cold weather when water also condenses out of air. This is known as smog and is a visible indication of air pollution. 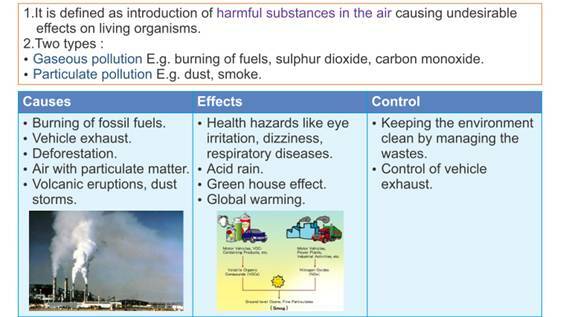 An increase in the content of these harmful substances in air is called air pollution. Some amount of water exists in the form of water vapor in the atmosphere. Fresh water is found frozen in the ice-caps at the two poles and on snow covered mountains. The underground water and the water in rivers, lakes and ponds are also fresh. However, the availability of fresh water varies from place to place. Water dissolves the fertilizers and pesticides that we use on our farms. 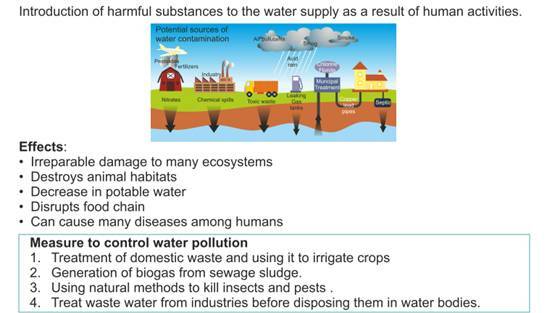 So some percentage of these substances is washed into the water bodies. Sewage from our towns and cities and the waste from factories are also dumped into rivers or lakes. This results in water pollution. The Sun heats up rocks during the day so that they expand. At night, these rocks cool down and contract. Since all parts of the rock do not expand and contract at the same rate, this results in the formation of cracks and ultimately the huge rocks break up into smaller pieces. Water helps in the formation of soil in two ways. One, water could get into the cracks in the rocks formed due to uneven heating by the Sun. If this water later freezes, it would cause the cracks to widen. Two, flowing water wears away even hard rock over long periods of time. Fast flowing water often carries big and small particles of rock downstream. These rocks rub against other rocks and the resultant abrasion causes the rocks to wear down into smaller and smaller particles. In a process similar to the way in which water rubs against rocks and wears them down, strong winds also erode rocks down. The wind also carries sand from one place to the other like water does. The topmost layer of the soil that contains humus and living organisms in addition to the soil particles is called the topsoil. The quality of the topsoil is an important factor that decides biodiversity in that area. Removal of useful components from the soil and addition of other substances, which adversely affect the fertility of the soil and kill the diversity of organisms that live in it, is called soil pollution. The large-scale deforestation that is happening all over the world not only destroys biodiversity, it also leads to soil erosion. All of the water that falls on the land does not immediately flow back into the sea. Some of it seeps into the soil and becomes part of the underground reservoir of fresh-water. Some of this underground water finds its way to the surface through springs. Or we bring it to the surface for our use through wells or tube wells. Nitrogen is an essential nutrient for all life-forms and life would be simple if all these life-forms could use the atmospheric nitrogen directly. The nitrogen-fixing bacteria are found in the roots of legumes in special structures called root nodules. Other than these bacteria, the only other manner in which the nitrogen molecule is converted to nitrates and nitrites is by a physical process. During lightning, the high temperatures and pressures created in the air convert nitrogen into oxides of nitrogen. These oxides dissolve in water to give nitric and nitrous acids and fall on land along with rain. These are then utilized by various life forms. Carbon is found in various forms on the Earth. It occurs in the elemental form as diamonds and graphite. 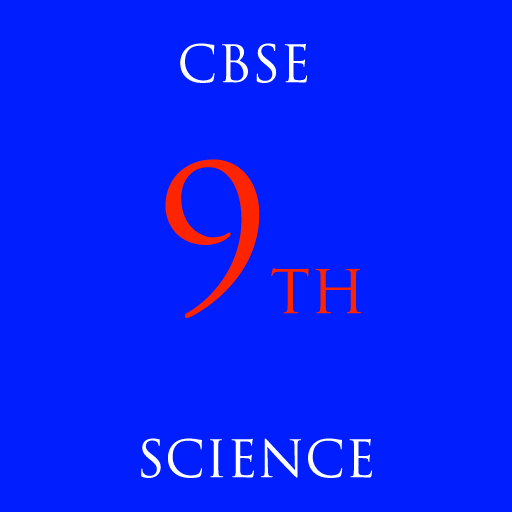 In the combined state, it is found as carbon dioxide in the atmosphere. Carbon is incorporated into life-forms through the basic process of photosynthesis which is performed in the presence of Sunlight by all life-forms that contain chlorophyll. This process converts carbon dioxide from the atmosphere or dissolved in water into glucose molecules. These glucose molecules are either converted into other substances or used to provide energy for the synthesis of other biologically important molecules. Oxygen is a very abundant element on our Earth. It is found in the elemental form in the atmosphere to the extent of 21. In the crust, it is found as the oxides of most metals and silicon, and also as carbonate, sulphate, nitrate and other minerals. In the upper reaches of the atmosphere, a molecule containing three atoms of oxygen is found. And is called ozone. But it performs an essential function where it is found. It absorbs harmful radiations from the Sun.